Thrill with me, with my final batch of cookies for 2016. I made the “Hazelnut-Raspberry Sandwich Cookie Wreaths,” from Fine Cooking for all the right reasons: they’re pretty, they’re delicious, they’re crowd-pleasers. Are they fussy to make? Well…yeah. But, you can do this. While your two sticks of butter soften, you should toast your hazelnuts, in a dry pan on the stove top. How lovely they smell as they toast. To then skin them, wrap them in a clean dish towel and rub them around, massage them, so they give up their skins. It’ll work. Be meticulous. Grind those skinned nuts in your food processor and experience the joys of that bold hazelnut scent. Intense stuff. Mix your dough, roll two disks between parchment paper, then find a cookie sheet that’ll fit in your refrigerator, so you can chill this dough. Yes, I warned you this is fussy. After all that, you get to cut out your two different shapes (re-roll the center cutouts), and chill them all again(!). Are you freaking out? You shouldn’t. The baking is easy. I placed a bit of seedless raspberry jelly in the center of each cookie sandwich, then sprinkled some powdered sugar dust. Victory. To continue down the “fussy” road, I also made the “Neapolitan Sandwich Cookies with Strawberry Buttercream,” when I figured I could handle this cuteness. It was within my reach! See how the ingredient list is simple and straightforward: you just need to mix the two different doughs, then roll, cut and chill the cookies. This recipe asks to chill the cut cookies in the freezer on a baking tray, but my freezer will not fit such a tray. Instead, I cut the little cookies, then placed them on a piece of parchment paper in the freezer. Brilliant! After 10 minutes, I pulled out that parchment, placed it directly on a baking sheet, then baked at 350 degrees F. Easy. Next, I made the “Pistachio Amaretti,” from Fine Cooking, because these were special, minimalist cookies: the six ingredients do not include flour and the dough is mixed in the food processor, rather than the stand mixer. 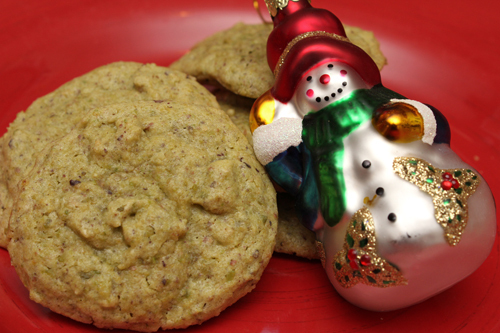 And let’s not overlook…pistachios! I was relieved to form the cookies on the baking sheets, then leave them there for an hour before I baked them. No chilling, for a change. This is a “wow” cookie. Bite into one and taste the magic. Next, I made sure to dip into the marvelous meringue world. You know this place: pillowy sugar miracles that elicit coos of comfort. 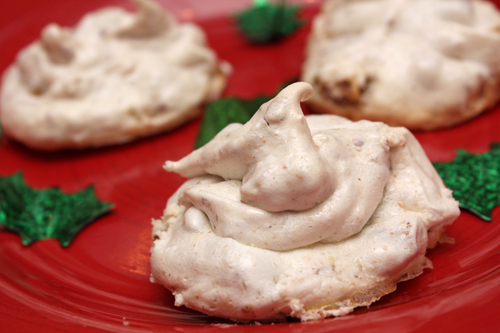 First, the “Almond-Meringue Cookies,” from Food & Wine. A meringue cookie recipe template is always bare-bones: egg whites + sugar. Here, I also got to add toasted, chopped almonds to the foamy egg whites. Then, the typical meringue formula followed, with a low-temperature bake and a “firming” spell in the turned-off oven. To push it, I also made the “Fudgy Meringue Cookies,” from Bön Appetit, simply because they stretched the meringue concept further. These are chocolate. Crazy, right? 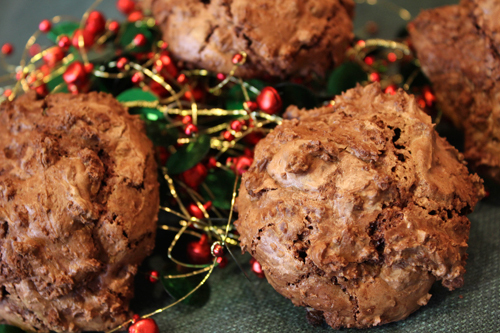 They include both chips and cocoa powder, affecting the texture of these cookies in such a fantastic way. Go wild. 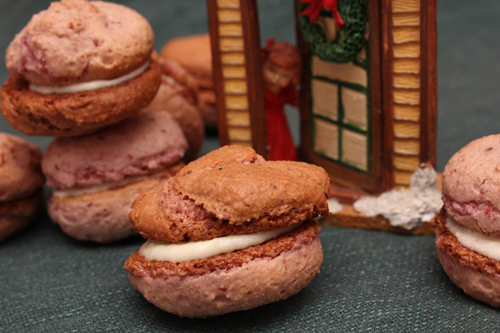 Next, I made some “Strawberry Macarons with Honey Peppermint Frosting,” because I haven’t yet included this exhilarating cookie on a holiday-specific baking spree. 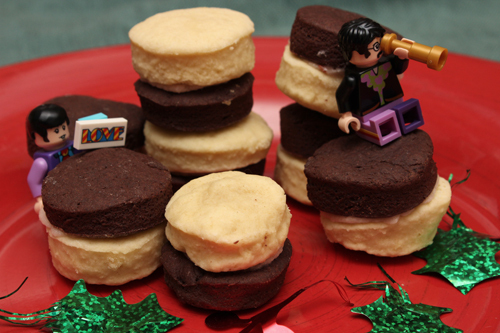 You know I’ve delved into macarons before (see here, and here). I manipulated the M’s Belly recipe with strawberry dust (again) to achieve this natural, pink color. And, I adjusted the Better Homes & Gardens frosting recipe to include a bit of peppermint extract rather than vanilla. Macarons are all about technique. They’re intimidating and stressful. But, knowing that, you can accept the challenge and move forward, especially if you’re not too worried about how pretty these should look. My versions are, admittedly, quite grotesque in appearance. Egg whites, almond meal, lots of sugar, and a piping bag. Do it and please everyone who tastes them. 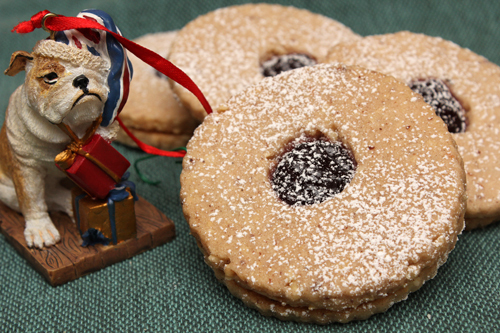 As a final hoorah, I made the “Peanut Butter and Jelly Thumbprint Shortbread Cookies,” from All Recipes. 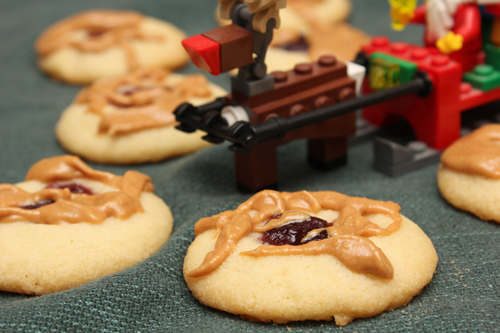 As you can see, these are unashamed thumbprints, with a bit of peanut butter and jelly thrown in. Easy to make, easy to eat. Enjoy your cookies this year.